Utah's The Used is back on the scene with their fifth studio album, Vulnerable--their first since 2009's Artwork. It was produced by Goldfinger's John Feldmann who is also responsible for producing The Used's first three albums. Vulnerable contains a similar balance of hard rock and emotional pop as the band's previous albums, but one thing that sets it apart musically is the prominent use of electronic beats and effects. The aptly named opener "I Come Alive" is dramatic and full of life. Big and theatrical, it features an eerie choral arrangement sound accompanied by an electronic bell or chime effect. By the time Bert McCracken's vocals hit, the song takes on a more guitar-oriented rock sound. The electronics briefly come back after the first chorus, along with a very interesting dubstep-esque segment. The rock returns for the second verse and the remainder of the track. "Shine" is one of the "poppier" tracks from Vulnerable. I wasn't a huge fan of the vocals in the beginning of it, as they seemed a bit whiny for my taste. However, the empowering and uplifting chorus of, "It's my time to shine / do it my way / 'cause it's my time baby!" totally makes up for it. A laid back, groovy bridge contrasts with the upbeat chorus. The song's verses feature many electronic elements, but the chorus gets its liveliness from the guitar. One of the harder and heavier tracks from Vulnerable is "Now That You're Dead", in which electronic artist William Control contributes. It has a slow but heavy intro and begins with a female speaking voice that sounds as if it's been taken from an old movie clip. "Now That You're Dead" contains harsher vocals compared to most of the album. They are coarse and gruff and often screamed, rather than the often utilized bright, emo-pop sound. This particular song sounds pretty impressive to this metalhead. It was almost unexpected and sounds like it would come from a band like, say, Papa Roach. "Kiss It Goodbye" is another hard rocker from Vulnerable. It features a drum and guitar-heavy intro with subtle electronic elements. The bass line is heavy, and the vocals are coarse, yet muffled. This song is strangely catchy, and what is even more strange is the very end of the track. The last few seconds of "Kiss It Goodbye" boast the phrase, "It's getting, it's getting, it's getting kinda hectic" repeated in an almost beatbox manner over some electronic beats. Vulnerable's final track is the edgy pop masterpiece "Together Burning Bright." Rather than electronics or a hard rock guitar, the piano is most prominent on this one. The chorus of, "I think it's gonna be alright / I think it's gonna be ok" is highly infectious and reminiscent of GOOD '70s pop/rock music in the vein of Elton John or John Lennon. "Together Burning Bright" is a fantastic ending for the album. It is very soothing after all the ups and downs of emotions--and the ranges of musical styles--that are present across the album and within each song. Even though I was nicely surprised by some of the harder rock tracks, this one is without a doubt my favorite. It is sincere and flat out pleasant to listen to. From beginning to end, Vulnerable features a wide array of musical styles. There's pop, hard rock, electronica, and even some dubstep thrown in. I would recommend The Used's Vulnerable to heavy music fans who aren't afraid of having some electronic elements mixed in with their rock, or rockers who are just looking for something kind of different. 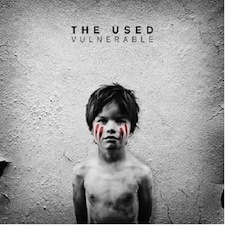 The Used's label of "emo" made me hesitant at first, but after a couple of listens, Vulnerable really grew on me. Their lyrics and musical expressions did reveal a wide range of emotions, but it never once brought me down or became unenjoyable.